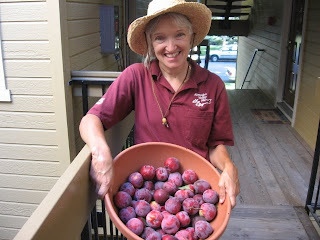 The guys at work climbed up and picked me some of the Santa Rosa Plums that were ready or at least close to being ready. Now they want me to make some jam. I will let these ripen up a little bit more before I use them and hope they will get me a few more before the birds discover them. I like to let the birds tell me when they are ripe, they have the best taste in plums. Michael makes the best plum cake, can't wait for that! Maybe he will let me share the recipe. He uses the Italian Prune Plums though and they aren't quite ready yet. I love this time of year for cooking. I like to make it my challenge to see how much of a meal I can make with what comes from my garden. 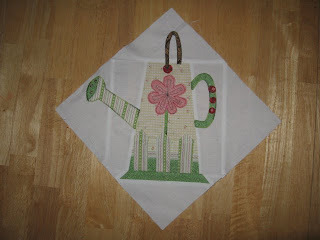 I have finished the watering can appliques for my little quilt project and they have come out really cute. I will try to get a picture of them later today and get them posted. I am working on the color scheme I want to use for the rest of quilt and may have to make a trip to the fabric store in order to finish it. Guess I will have to stimulate the economy with my government check for that one and what better way to do that than to buy fabric! Of course that will also take gas to get there which at $4.50 a gallon might cost more than my fabric. I could always walk to Hancock Fabrics which is about a half a mile away and get a little exercise in the process. Hmmmm! Enjoy your summer day and eat something fresh! My Mom sent me a wonderful little surprise yesterday from Harry and David. It was like a little birthday party in a stack of cute boxes. I always love the boxes that they package their gifts in and save them all. 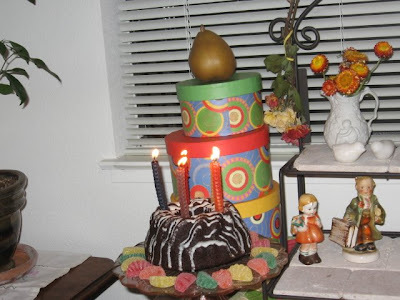 This was a Happy Birthday tower and was filled with candy, popcorn, a little cake and some pears. What a treat and the boxes will be perfect for sorting out and storing some sewing supplies. 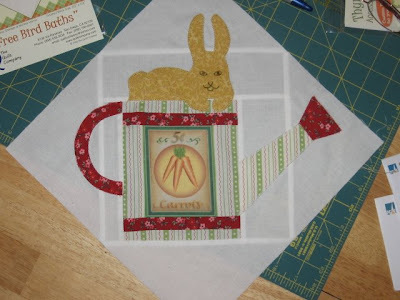 While thinking about the tea party quilt idea with the Susan Branch fabrics I got side tracked when I stumbled upon a pattern by The Quilt Company called Thyme to Water. They give the measurements of your block after each step which is very helpful since there are several pieces and well, get one wrong and the whole block could go wonky on you.. It was meant to be a block of the month quilt, but I bought all the block patterns at once and they mailed them to me very quickly. I couldn't wait to get started so within a week of seeing them on the internet I have already finished 2 of the 6 blocks. I am using up my stash and boy are they fun to do. The directions are so clear and precise. 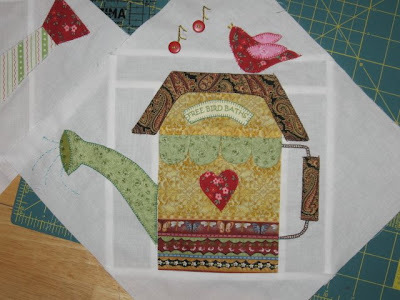 These blocks were so fun to do I have already got block 3 cut out and can't wait to get home from work tonight so that I can start it. 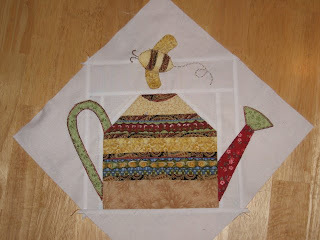 They have mixed in a little embroidery and applique into each block. 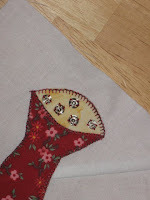 I have found a stitch I like on my machine that I am using for the applique and it is going quickly. People who amaze me are people who create and give and keep smiling. I have found many of these people through out my life and have struggled to be one of them, but it has been difficult at times for me to find whatever it is that keeps them going and calm. I think the calmness is the key ingredient...how do we keep a balance in our lives that will help us to get through the tough times? I stumbled across a blog today of a young lady who seems to have such balance and a massive amount of creative energy. She weaves her own cloth and then makes things with the fabric she weaves. She is also very artistic and has written a cookbook which she is selling in her Etsy shop the cookbook is called Daily Fiber and she has done some wonderful illustrating in it. If you check out her blog you will want her cookbook because she has lots of pictures of food that she cooks and it all looks so healthy and beautiful...we should all eat like this all the time. I am glad that there are people out there who can inspire me even if I don't take the same path as they do, it is nice to know it is possible to have that balance and something to always be striving for. Maybe just the process of striving for something you know you want to obtain in your life is enough, because once you get it...then what? I will have to keep adding to this blog bits about the people who inspire me. Actually everyone on my blog roll inspires me on the internet then there are lots of people in my life that have inspired me in one way or another. 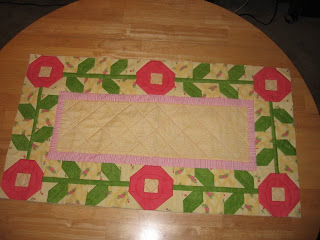 I am still working on the table runner from the Easy Quilts magazine and it has been anything but easy. The reason though is my own doing. I should get into a sewing class somewhere and learn from the pros, but I am teaching myself with books and information I pick up on the internet. The best lessons though have been from hands on learning which means I have to do things wrong a time or two and sometimes three...the seam ripper and I are getting to know each other very well. I have decided to keep a notebook in my sewing basket to log down information on each of my projects and what worked or didn't. The list for this little project is long...things I should have known like always quilt with your walking foot or you will get puckers. I made several changes to this the biggest one being the size, this is where I learned my biggest lesson...MEASURE, MEASURE and MEASURE again! I was running low on some fabrics and didn't want to go buy more for an experimental project so I made some changes and ended up having to re-cut the middle a couple of times. 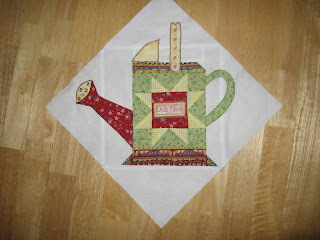 One thing I played with on this project that worked out really well was using different colors of thread for the quilting. My back side was a light yellow gingham and quite plain so I used green thread on the stems of the flowers and a red to quilt the flowers. This was my first try at freehand stitching...well I'm calling it that since I did circles in each flower. I do like the way this looks on the back side.